Clear, natural sound – Because Lyric sits so close to the eardrum, it utilizes the natural acoustics of the ear to provide a clear crisp sound. 24/7 hearing – Wear Lyric around the clock for 2-4 months at a time without taking it out. Lyric is designed for people with mild to moderate-severe hearing loss. Our Doctors of Audiology will assess your specific hearing needs to determine if Lyric is right for you. 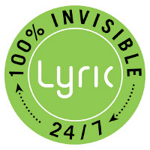 Call today to receive a free 30 day trial of Lyric. You are just a phone call away from hassle free hearing.